Pokémon has been a big deal over the last few months, and it’s been a seriously addicting game. I’m sure there are some of you here that play (I sure do!) or at least know someone who plays. 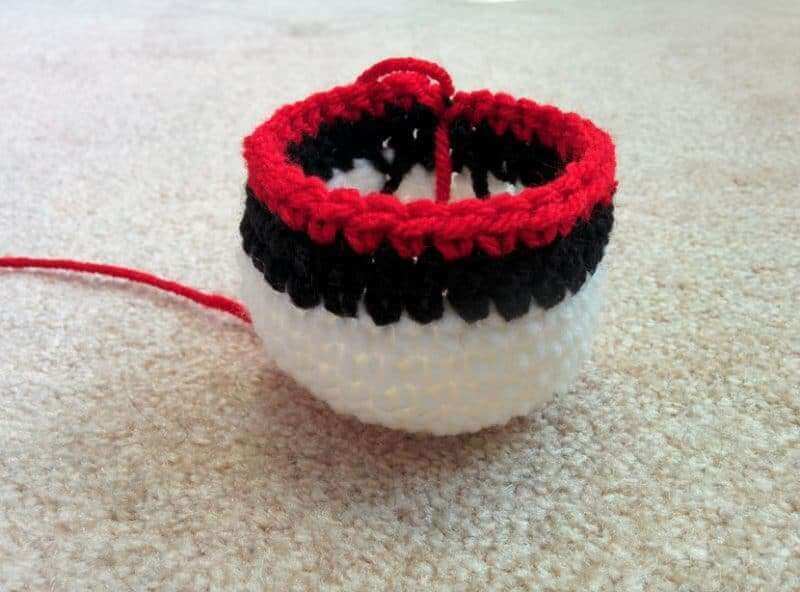 A little while ago, I crocheted a pokéball for myself just because I wanted one. When my nephew saw it, he asked me to make some for him too. And you know what? They are really, really easy to make. 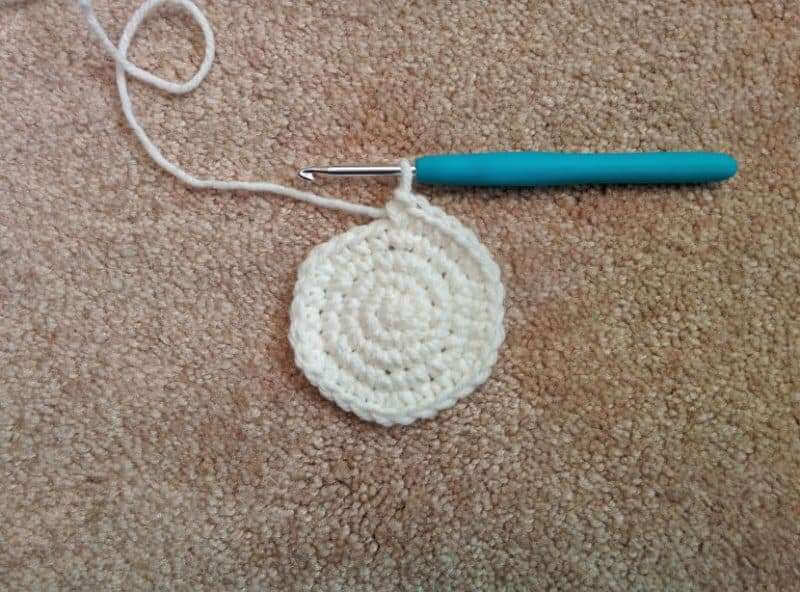 It’s just a simple crochet ball with a button, but it has a distinct pattern. 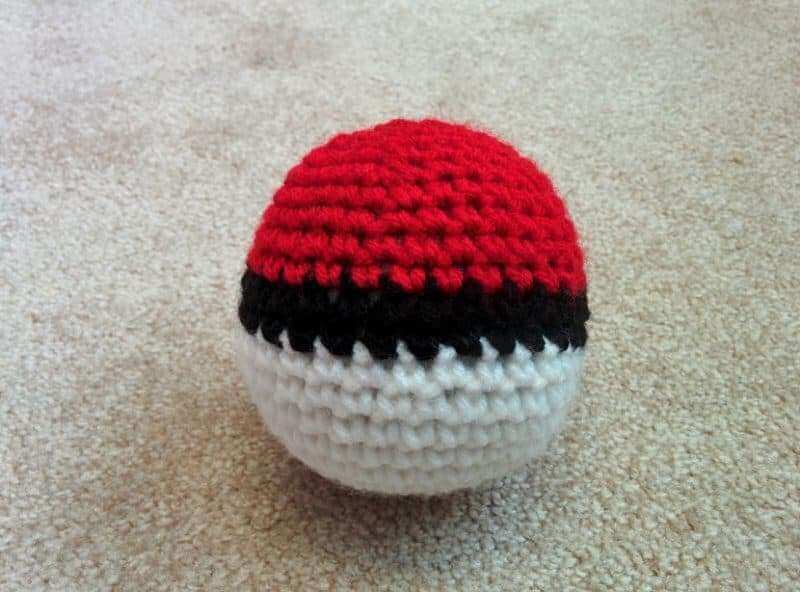 Even if you aren’t interested in Pokémon and pokéballs, you can still follow along and make a regular crochet ball. These crocheted balls make really great gifts for babies, kids, and you can even make them for your pets if you want to. Because they’re only made of yarn and stuffing, you can easily whip up a bunch and gift them to new moms. I did that for my cousin a few years ago and she loved them! So, let’s get started! All you need to make these is some yarn, a hook, and stuffing. For these, I’m using worsted weight yarn and a 4.00mm hook. In my pictures below, the colors change for the pokéball, but I explain those colors changes after the basic tutorial! 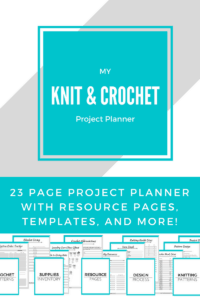 This pattern uses only a few basic techniques, but if you need help with anything from creating the magic loop to increasing or binding off, check out The Beginner’s Guide to Crochet (free ebook). 1. Start by creating a magic loop and then chain 1. This chain 1 will count as your first single crochet (SC). Work 5 more SC into the loop, close off the circle and slip stitch to the chain 1 to finish (6 stitches total). 2. Increase by working 2 SC into each space (12). 3. *SC 1, increase*, repeat around (18). 4. *SC 2, increase*, repeat around (24). 5. *SC 3, increase*, repeat around (30). 6-15. SC around for 10 rounds (30). At this point, your ball is more of a bowl shape and needs to come in to close the top now. If you have any loose ends and tails, just leave them inside the ball and you won’t need to worry about them. 16. *SC 3, decrease*, repeat around (24). 17. *SC 2, decrease*, repeat around (18). Fill the ball with stuffing now. 18. *SC 1, decrease*, repeat around (12). 19. Decrease in every space around (6). 20. Bind off and cut the yarn. Thread the tail end through a tapestry needle and weave it through the remaining stitches. Gently pull the tail to close off the top of the ball and secure the end with a knot. Then, hide the tail end inside the ball or trim off excess yarn. And you’re done with the ball! 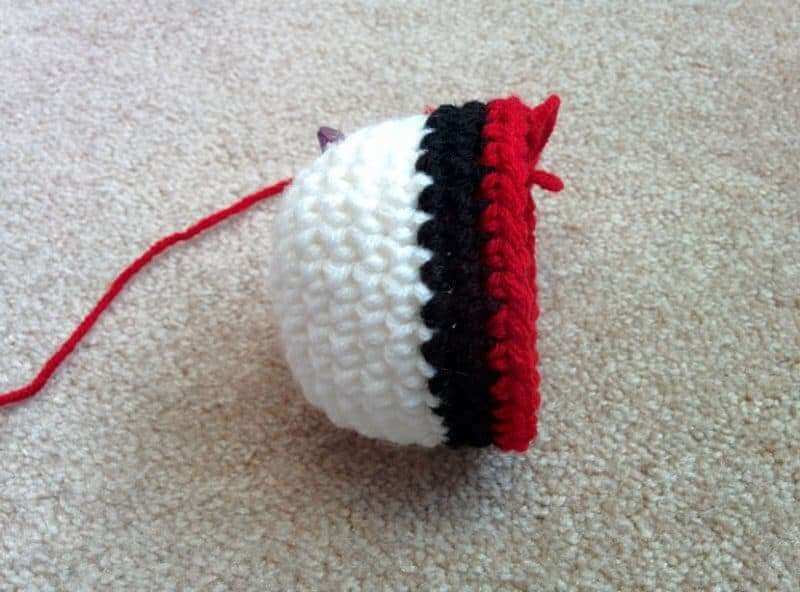 See how easy it was to make a basic crochet ball? All you need to do is create a circle, make it taller, then bring it back in. It’s so simple and once you get the hang of it, you can make a bunch without even thinking about it! 1. Creating a magic loop and then chain 1. Work 5 more SC into the loop, close off the circle and slip stitch to the chain 1 to finish (6 stitches total). 6-9. SC around for 4 rounds. 9-10. SC around for 2 rounds. 11-15. SC around for 4 rounds. 20. Now, bind off and close the top of the circle. Hide any loose ends inside the ball to finish. 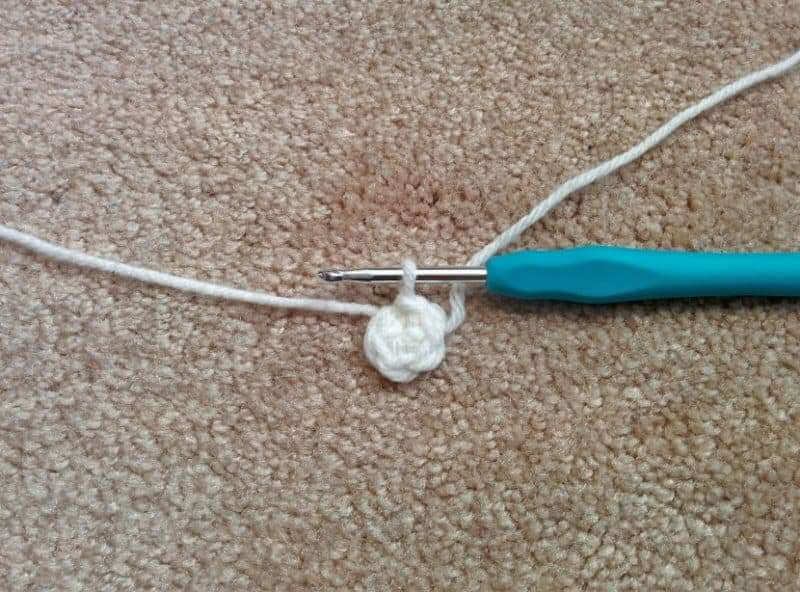 With white yarn, create a magic loop and then chain 1. Work 5 more SC into the loop, close off the circle and slip stitch to the chain 1 to finish (6 stitches total). Bind off and switch to the black yarn. Work one round of SC through the back loops only, and work loosely. Bind off and leave a long tail to sew the button onto the ball. If you had any trouble with the color changes being jagged or uneven, this pattern is really forgiving. Just add the button onto the jagged spot and sew it into place. 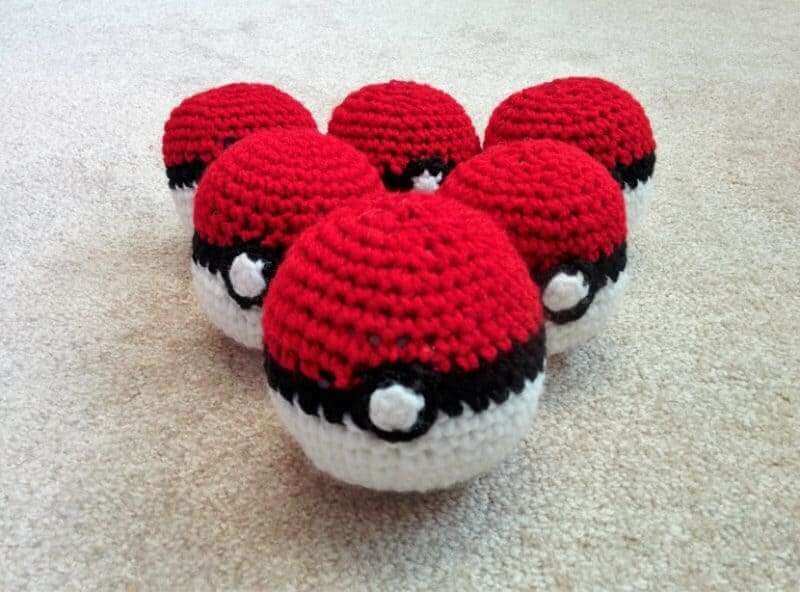 Now make a few more and you’re well on your way to being the very best! I absolutely love these and I know that my nephew is going to be thrilled to get them. He’s been asking, but I wanted to get pictures of the set before I gave them to him lol. Go and try this pattern out! Make some for your children, grandchildren, friends, or even yourself. They are so simple but they’re a lot of fun to make and play with (yes, I did play with them :p). I’m working on a few patterns for actual Pokémon too and (hopefully) they’re going to be pretty detailed. If you have any suggestions for a pokémon pattern you’d like to see, just let me know in the comments! Also, don’t forget to subscribe and get your free copy of The Beginner’s Guide to Crochet! 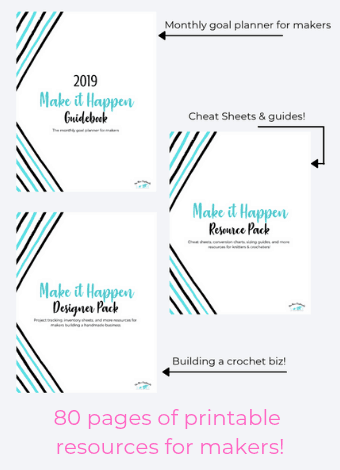 It covers all the basics of crochet from how to start out and work simple stitches to a few more decorative stitches, PLUS 15 patterns to practice all your new skills on. It’s pretty awesome, but I’m biased, so see for yourself. Just enter your name and email in the box below to sign up. Thankyou! 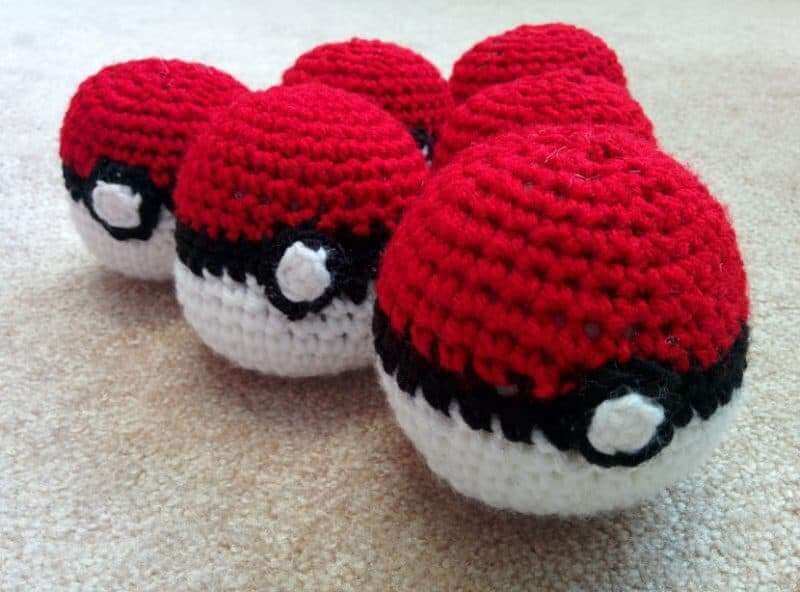 My 3 children are Pokémon crazy and I have finally begun my beginners journey to teach myself how to crochet! This is the first crochet project I have finished! I’m so glad you like them! 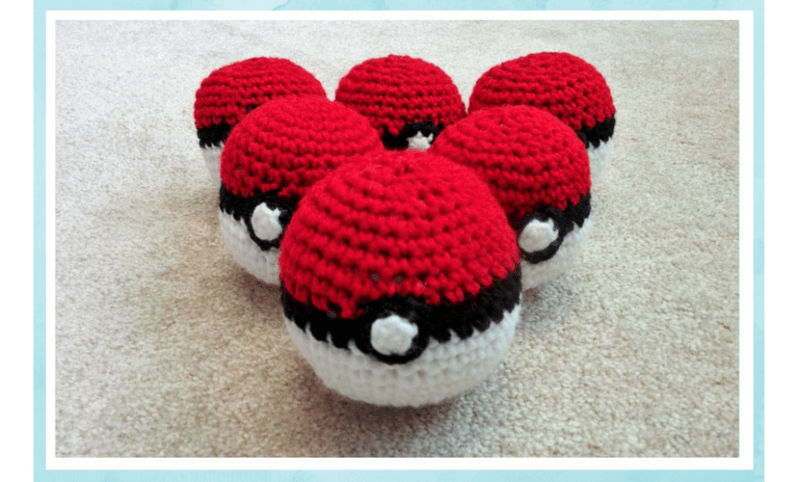 If you want to try some of the other Pokemon patterns too, you can find them on the blog. They’re also pretty easy and just have a few more parts. The Snorlax is especially beginner-friendly! Awesome pattern! Quick question – every time I make one, the black part in the middle never lines up perfectly. Even when I put the button right over that part, you can still easily tell that the black part is asymmetrical. Some of your photos seem to not have this problem!! Is there a secret, tip, or trick to making it look symmetric all around? There’s o secret. My lines didn’t meet up exactly either and the button just covered it up. You could make the circle a little bit bigger by working another row. Someone needs to fix the page, bc it’s too big for my tablet and the share buttons are blocking the text. Ah! I’m so sorry about that! I was fixing something and I forgot one little part of the code. It should be fixed now though! Wow what a great creation ever you made it. 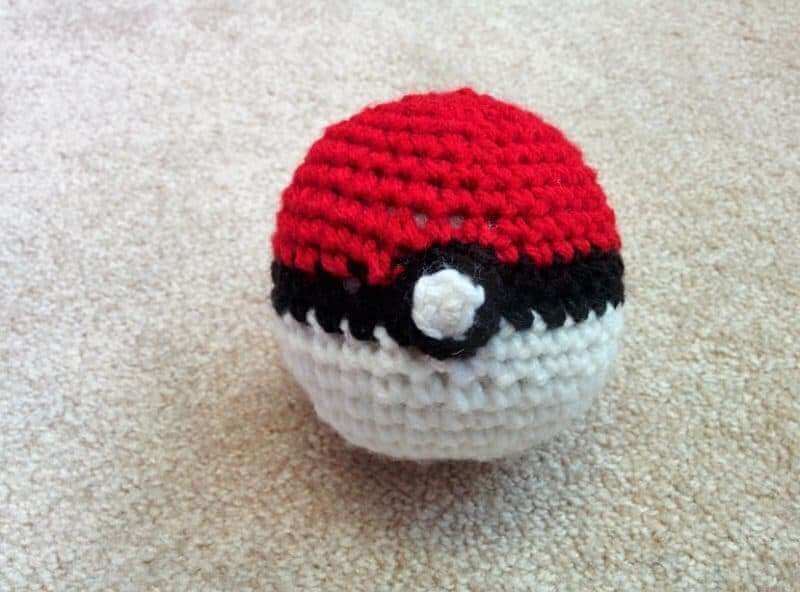 How can I make a small Pokémon ball? Thanks, Emily! 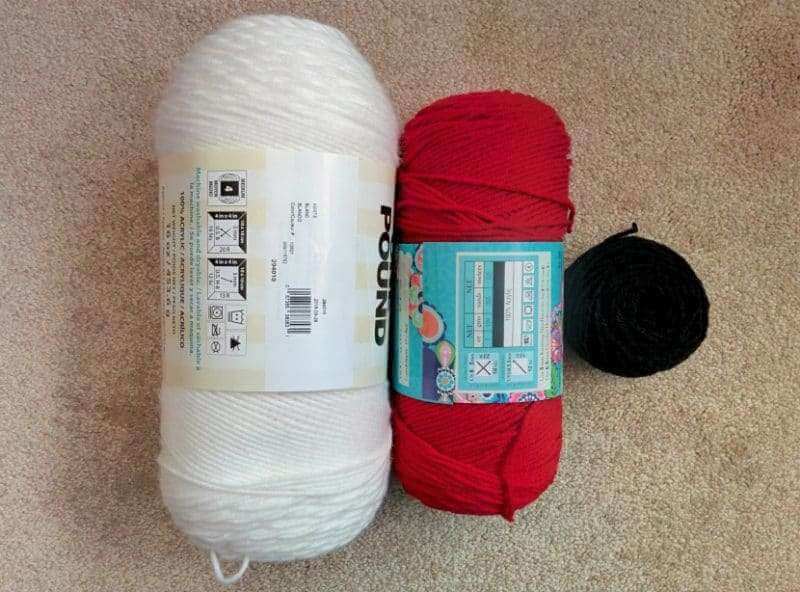 The easiest way to make it smaller would be using a smaller hook and and thinner yarn. That way you won’t have to change the pattern. But you can also just work fewer increase rounds and adjust the rounds afterwards so it’s still spherical. So, maybe remove 1 round from the increase section, 1 from the SC section, the black section, next SC section, and then decrease normally to close. 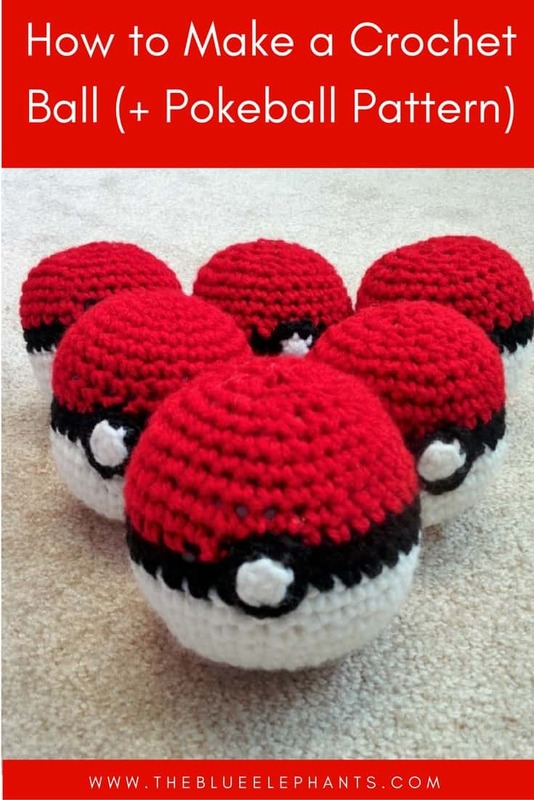 I am so excited to make these Pokemon balls. Currently, my children throw fishing bobbers around when they are playing Pokemon in the house, this ball is going to make their game a lot more fun and my house a lot quieter. Thank you so much for sharing!! I’m glad you like them Lindsey! 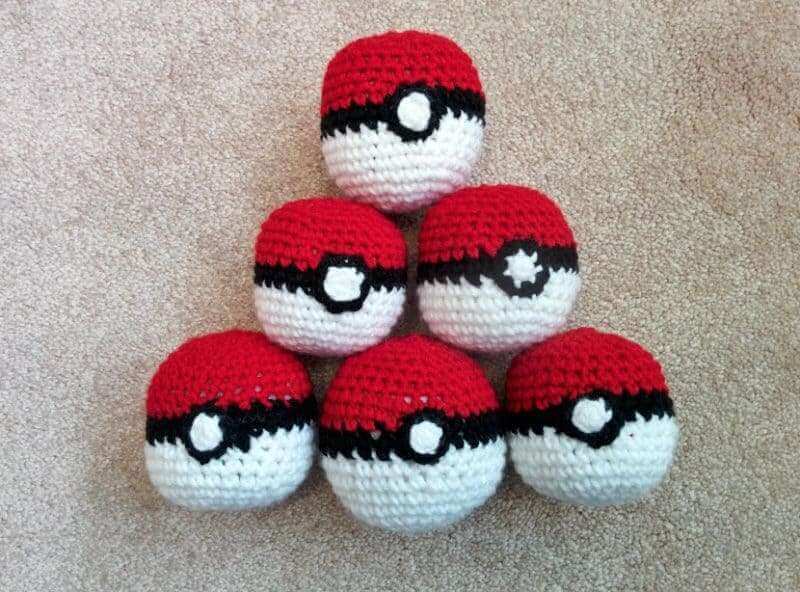 lol I remember thinking those bobbers looked like Pokeballs when I went fishing with my dad, too. These will be much softer on the house, though! My grandsons would love this, very clever craft. Thanks for sharing with us at the Merry Monday party. So fun, you did an amazing job with this! I always love your creations and wish I’d be able to crochet like this!!! Not a pokemon fan but these look so cool!